Many friends of mine ask me about the right way of writing an essay. There are certain steps one must follow to make a good essay. There are two different types of topics. If your objective is t write about something in general , you may choose a topic such as "Food. However, if your objective is to write an analysis or an specific topic, you may choose a topic such as "Fast Food". Once you set the topic, you are ready to move on to the next step. (A)You need to draw a circle, a square, or whatever shape you like in the middle of an empty paper and write the topic in it. (B) Then draw 3-4 lines from the center out into the page but make sure that you separate them evenly. (C) Then draw a circle, a square, or whatever shape you like at the end of each one of these lines. (D) Write your main ideas inside these shapes. If you are trying to explain a process, you want to write the steps that should be followed. However, if you are writing a debate, you need to write your best arguments. (E) Now that you have wrote the main ideas, you need to draw 3-4 lines from each idea out into the page. At the end of each of these lines, draw another circle , a square, or whatever shape you like and In each shape write the facts or information that support your main idea. Now that you have done this… You are ready to move on. 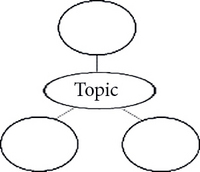 1: Write the topic at the top of the page. 2 : Write the Roman numerals I, II, and III, spread apart down to the left side of the page. 3 : Write the main ideas that you have about your topic next to each Roman numeral. 4 : Under each Roman numeral, write A, B, and C down to the left side of the page. 5 : write the facts or information that support that main idea next to each letter. Now that you made the basic structure for your essay, you are ready to continue. The point of writing a thesis statement is to tell the reader about the topic and the points that will be making. You need to have a look at your outline or diagram and decide on the points that these ideas suggest. What do the main ideas say about your topic? A) The first part states the topic. "Saudi's Culture"
B) The second part states the point of the essay. " has a rich and varied history"
Now that have done this ..it is time to write the the Body Paragraphs. At this point, all of the preparation you have been through will be put to work. (A) In the body of the essay, explain, describe, or argue the topic you have chosen. (B) Every main idea you have in your outline will become a paragraph. If you wrote three ideas than you have three body paragraphs. 1. Write down the main idea in sentence form. 2. Write down the supporting facts or information. 3. If you like, you can write a summery for each paragraph. By now, your essay only needs two paragraphs: the introduction and the conclusion. These two paragraph give a point of entry to and an exist from your essay. The Introduction should attract the reader's attention and gives an idea of the essay's focus. A) Start with an attention grabber. "Startling information, Anecdote, Dialogue, or Summary Information"
B) If the attention grabber was only a sentence or two, try adding one or two sentences that will lead from your opening to your thesis statement. C) Finish the paragraph with your thesis statement. The Conclusion is important because it brings closure to the reader and gives a summery of all your points. You only need to write 3-4 sentences. There are no set formals to write the conclusion. Just review the main points or simply say what do you feel about the topic. Check the paragraphs which one is the strongest. It is really useful to rearrange the paragraphs where the strongest always comes at the beginning. 2- Check the instructions for the assignment. a) Are your margins correct? b) Have you titled it as directed? c) What other information (name, date, etc.) must you include? d) Did you double-space your lines? The revision of your work is important. Make sure that you read and reread your paper. Once you have checked your work and did the necessary final touches. .I would say "Congrats!" Your essay is finished.. Indeed it is good information by admin. I liked it. Now I have made my mind up to follow this guidelines at the tiime of essay writing. thanks admin for such an useful information about essay writing. from now on i am fully confident that i will easly write an essay keeping all the points in mind whaich have been discussed there. <body><p>Thanks!This is really a good essay! thanks a lot for your guidance and could you please add some sentences to make it sounds more natural. thank u… it’s a guidance for me how to write in my next test.. It is useul for me so I would like to thank u for this lesson. thanks alot. i learned alot to write a well writen easy . i had known some but i have got alot of information just now on how to write an easy. thanks alot.